Formed back in 1978, England’s Whitesnake have become one of the most storied bands in Modern Rock-n-Roll. Come together after lead vocalist David Coverdale departed from Deep Purple. Joining Deep Purple in 1973, Coverdale contributed to the often titled Mark III and V line-up of the legendary Deep Purple. Coverdale embossed the final stage of the kings of the ’60s and ’70s heavy Blues Rock generation by recording and co-producing the Deep Purple albums Burn, Stormbringer (both 1974), and Come Taste the Band (1975) as a to-date unknown twenty-one year old newcomer behind the microphone. A big burden to fill the retired Ian Gillan’s footprints, Coverdale was an exception, thus launching him into Rock stardom. Initially coming from Heavy Blues Rock roots, Coverdale followed the late Deep Purple path as Whitesnaked released their 1978 debut album Trouble and 1979’s Lovehunter. Continuing to grow as a band, Whitesnake pumped out album after album before hitting their peak in the late ’80s with multi-platinum and several million sold hit albums like 1984’s Slide It In, 1987’s self-titled album, and 1989’s Slip of the Tongue. Remaining active through the years after a hiatus, Whitesnake relaunched for good in 2002, and since, the band has released new material and toured regularly. While the lineup around Coverdale has changed through the years, drummer Tommy Aldridge has been a. off/on regular since 1987, Winger guitarist Reb Beach since 2002, and the later additions include bassist Michael Devin in 2010, Night Ranger guitarist Joel Hoekstra in 2014, and Michele Luppi on keyboards. 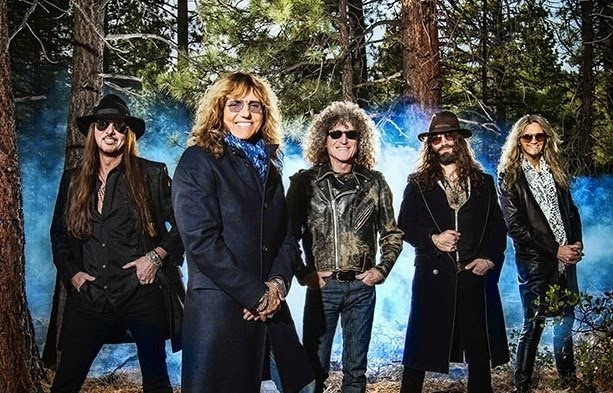 Ready for a new album, generations of Rock music lovers may get teary-eyed when Whitesnake released their twelfth studio effort titled The PURPLE Album on May 19th in North America. 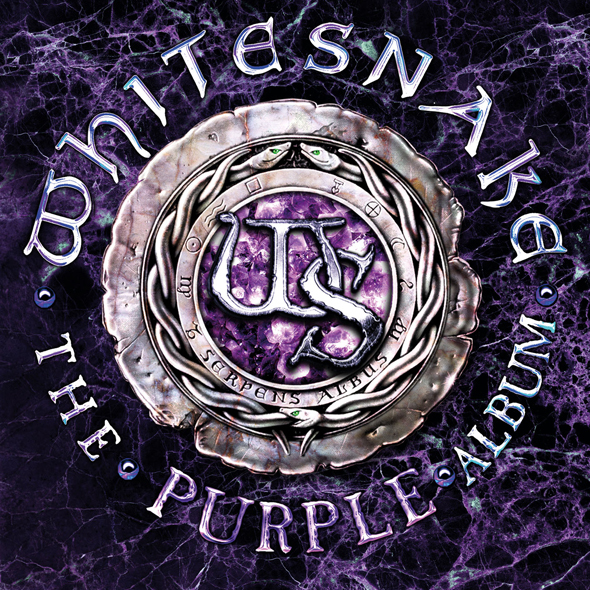 The band’s latest material is not only an ordinary studio album but a homage and tribute of singer David Coverdale to his contribution in Deep Purple. In the beginning, undecided plans for a Deep Purple reunion or a Ritchie Blackmore/David Coverdale-Project came to a halt when keyboardist Jon Lord fell ill with cancer and sadly passed in 2012. In the end, Coverdale decided to bring his, and the other Whitesnake members, favorite tracks of Lord’s with Deep Purple together on The PURPLE Album. Beginning The PURPLE Album with “Burn,” Whitesnake could not have made a better choice. The Aldridge/Devin rhythm-section pumps through the song mercilessly while Beach and Hoekstra fight a war with dueling lead guitar salvos that Mr. Blackmore himself would become dizzy. Overall, Mr. Coverdale is enthroned with an inspiring vocal-performance. “You Fool No One” shows the influence on the development of nowadays Prog-Metal heroes like Dream Theater and members of the syndicate. Again, Beach and Hoekstra blister beside Coverdale’s god-like performance on vocals. It is one of the crucial points that make The PURPLE Album something special. Also ballads like “Sail Away“ from Burn or “Soldier of Fortune“ off the Stormbringer album echo as timeless tracks. Forty years later, the tracks are translated into a more modern and powerful delivery. “The Gypsy,“ also from Stormbringer, could form a seamless segue in Whitesnake’s live-sets between “Don’t Break My Heart Again“ and “Here I Go Again.“ Although the tracks are reaching over an era of three Deep Purple albums, which are very different, Coverdale manages to leave his special mark, but sounding fresh on the highest level and spreading the idea this man is as far away from entering pension like Rock music is threatened with extinction. Moving along, “Lady Double Dealer” is followed by “Mistreated,“ which could be the best version of the latter tracks since Rainbow’s Ronnie James Dio’s live-recording, 1976 album, On Stage. Evoking a ball of emotion with Hammond organ and affect guitar solos, “Keep on Moving” is a more experimental, funky, post-Blackmore-era Come Taste the Band song fans will love. Then there is the cult followed track, “Soldier of Fortune,” which Coverdale and company capture a beautiful acoustic based sound that breathes, allowing listeners to reflect. Completing the journey back in time “Lay Down Stay Down” and “Stormbringer” are given strong modern Metal guitar sounds that bring in the new generation in a bold way. The PURPLE Album is meant to be a tribute to the Rock prime-fathers for old fans and an introduction to newer Rock music lovers who may have not been introduced to Deep Purple yet. It would be absurd to compare the material to the original recordings, because this is a different era with different recording techniques and styles. Therefore, fans should look at the material as a whole different entity and enjoy the tight sounds Whitesnake offer up. In closing, The PURPLE Album assures a special place for these classic songs in the ancestral portrait gallery. CrypticRock gives The PURPLE Album 4.5 out of 5 stars. Sascha became infected with Rock music by his parents at the age of 8 years. Since visiting his first concert (Iron Maiden's World Slavery Tour in 1984) and watching Mötley Crüe during their Shout at the Devil performance, he became addicted in doing so, breathing and living Rock-n-Roll in all its colors. 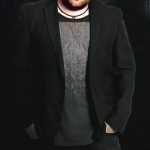 Since 1998, Sascha has played bass and keyboards in German Industrial Goth-Rock band DAS SCHEIT and has been part of many other projects around Europe. Sascha also has written for several German webzines over the years.